I’ve been spending lots of time writing the Ship Hotel book, due out in 2010. More than 2 months after my request for info, I still get letters and photos daily — it’s getting hard to wrap up! Here’s a nice photo I just color-corrected. As you’ve probably seen in your own family photos, pigments fade from old Kodacolor prints, leaving them pink. I really enjoy working to bring them back to how they should look. Lincoln Highway Companion is still at least a month away from release but Stackpole Books just added it and my other books to their web site. For LH Companion click HERE; Greetings from the LH can be found HERE. Companion is already printing so no more changes can be made, but the road is always in flux. 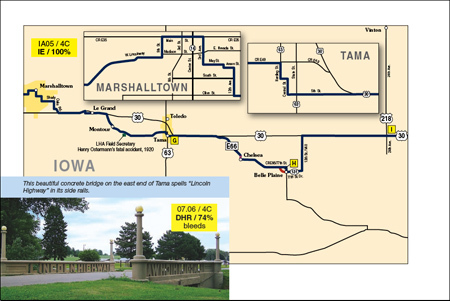 Here’s a draft page from Iowa — a popular stretch that includes Preston’s station in Belle Plaine and the bridge at Tama with the highway’s name in its rails. Creating and correcting the maps for this book added many, many months to its production. This entry was posted on March 30, 2009 at 11:40 am and is filed under highways, history, Lincoln Highway, roadside, travel. You can follow any responses to this entry through the RSS 2.0 feed. You can leave a response, or trackback from your own site. Congratulations on nearing your release date on the Companion, is there any way to get an autographed copy? I remember going to the “Ship On The Mountain” when I was young. We would put money in the binoculars so you could see the view. That Iowa page brings back fond memories. I used to turn at the 218/30 corner for work every day, and saw the Lincoln Highway murals in Belle Plaine before I knew what the Lincoln Highway was! nice job on the photo color correction! Thanks Larry. I should add that I’m not colorizing these photos — just removing what should not be there to let the original come through. In the parlance it is still color correction. You are dropping out the red tint that developed over time and enhancing the true image. What controls did you use? I do a bit of everything but my favorite is Curves, mostly the Red and Blue. I’ll have to check that out. Like you, I use a lot of everything, levels, brightness/contrast, shadows/highlights, selective colors, etc.